VCI+DRY is particularly designed by combining dehumidifier and VCI effectually. Dehumidifying packages and VCI products have been widely used to prevent corrosion for many years. Dehumidifying products slow down corrosion by taking water vapour, which is one of the main causes of corrosion, from the environment. VCI products form a protective film on the metal at the molecular size and prevent the corrosive gases, such as water vapour and oxygen, from reaching the metal. On the other hand, when the humidifier package is used alone, new water vapour penetrates into the package due to water permeability or through holes formed during application, and the dehumidifier may lose its effectiveness in a short time. 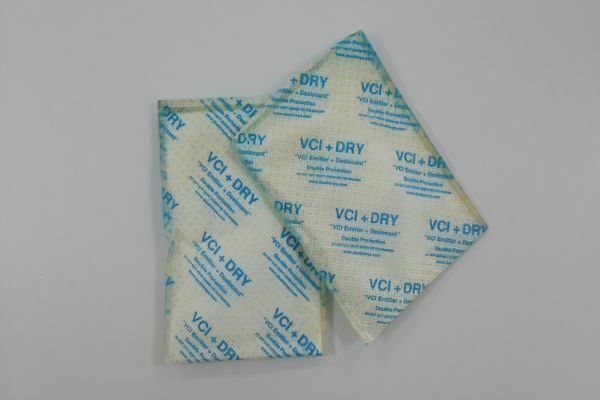 When the VCI package is used alone, moisture condensation that occurs during the day and night temperature fluctuations can damage the protective VCI film. Using the dehumidifier and VCI products together provides complete corrosion control. absorbing humidity, and at the same time it spreads VCI vapor to form protective VCI film on the metal surface with a single product. While the 100 gr VCI+DRY package absorbs up to 4 pcs of 8 unit clay packages (4x270≈1080g) humidity with its up to 300% dehumidification capacity, it also provides VCI efficiency with the VCI steam that it spreads. Another important advantage is that it is approximately 10 times lighter than the active clay packages used as equipollent, thus provides transportation and stock availability. With this new product that will revolutionize the corrosion control, it is possible to provide a longer and more effective corrosion control, for example; by using one 100 gr VCI+DRY package instead of using 4 pcs of 8 unit dehumidifiers in an ordinary bag. - Safe usage with no toxicity. Does not contain harmful chemicals like nitrite, chromate.